Amazon doesn't appear to have any interest in slowing down on acquiring the rights to video content for its Prime Instant Video service. Speaking during an earnings call last week, Amazon CFO Tom Szkutak didn't mince words when it came to the subject of how Amazon feels about all of the video content it has been buying up as of late. 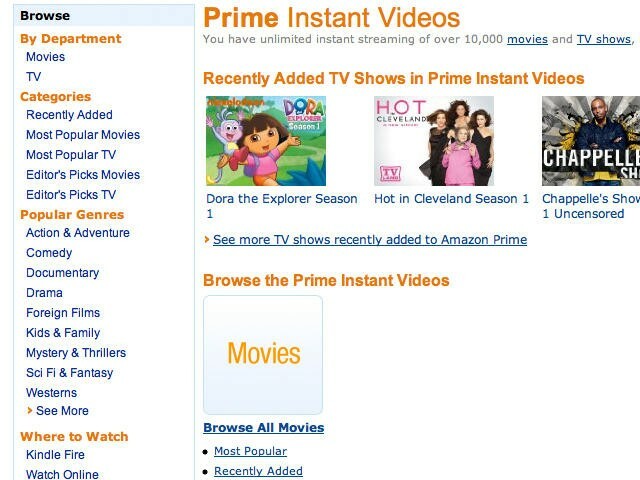 "We're seeing great new [numbers] of subscribers coming to Prime and we like what we see so far," said Szkutak. "That's why we continue to invest there." For $79 a year the customers are able to enjoy unlimited two-day shipping from the retailer, but they also receive perks such as access to over 30,000 videos for free as well as novels they can check out on their Kindle. Currently it is estimated that Amazon is spending around $1 billion on content agreements for Prime Instant Video and LoveFilm Instant, its subsidiary in the U.K. "We're investing heavily in video content through our subsidiary LoveFilm," Szkutak said. "We have added a lot of content and we'll continue to monitor it very carefully. You should expect us to add more content going forward. Those are the primary drivers for what you're seeing in operating income in Europe." Going forward, that $1 billion is expected to increase as exclusive deals between Netflix and various companies come to an end, and it's becoming fairly obvious that Amazon wants a bigger piece of the streaming video market. From the strength of these words, it may be time for Netflix to start swearing this situation a bit more.